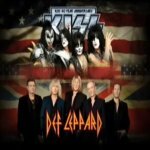 The Def Leppard and KISS Summer Tour 2014 hits Tulsa, OK on 29th August and the venue has posted an advert on YouTube. The short video previews the show at BOK Center on 29th August. The 41st date of the tour and first visit to the city since September 2011 on the Mirrorball tour.